Asparagus are the most elegant finger food, best plucked off a linen napkin and dipped in a side of homemade mayonnaise. My grandmother served them this way (and Emily Post approved). A staunch East Coast W.A.S.P., she had a silver utensil for every dining occasion (from pickle fork to iced tea spoon) but she insisted the proper way to eat asparagus was one by one, bite by bite, beginning at the tip and working through the stalk. She might have done the same with fiddleheads had she known of them. Like morels, they're a Midwestern thing. I inherited the sterling pickle forks and iced tea spoons, along with strict opinions about how to cook and serve asparagus. The first being, to OVERCOOK, yes, overcook, not so they're mushy, but beyond tender crisp. When they're left in the pot a little longer so that their colors fade from emerald to slightly dusty green, their flavors open up and they taste less grassy, slightly floral, more of themselves. They are perfect for dunking in golden mayonnaise. Fiddleheads need just to be slightly trimmed of the dark brown stem, then cooked along with the asparagus. Their flavors are akin, though more nutty with a bitter edge. Cook and serve them together, on white napkin, and forget the fork. To properly cook asparagus and fiddleheads, bring a pot of lightly salted water to a boil. 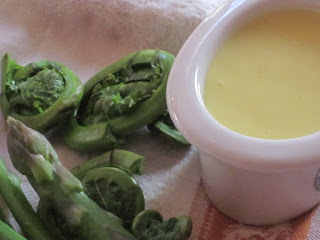 Add the asparagus and fiddleheads and cook until their colors turn from bright green to muted, about 5 minutes. Drain and serve on a white napkin (linen, of course). This is ridiculously simple and pure and nearly as easy as opening a jar. It will keep up to two days in the refrigerator so make only as much as you need for a short time. Put the yolk in to a medium bowl and whisk in the mustard. Whisk in 1 drop of oil, then begin whisking in the remaining oil in a very slow steady stream. After you've added about 1/4 cup of oil, the mixture will thicken. Continue whisking until the mayonnaise comes together then season with the lemon juice, salt and pepper and a drop or two of Tabasco.